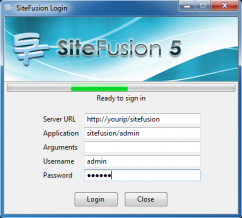 Here we will try to provide you with all information needed to setup a SiteFusion server and connect to it using the SiteFusion client. $ php -m | grep -e "json\|sockets\|posix\|pcntl"
It should show all four module names, if anything is missing it's not installed. Install SiteFusion by downloading a release package or by using Git. Where you see 5.x.x below, replace for the version of your choice. In my case, the user is called 'dev' and I extracted the package to /home/dev/sitefusion, although a more suitable location for production environments might be /usr/local/sitefusion or something like that, depending on conventions on your operating system or distribution. The file daemon.conf holds the configuration for the SiteFusion daemon. Start as root (default and recommended): Leave the runtimeDirectory and logfile locations to the default system locations, set changeIdentity to TRUE and fill in a safe user (systemUser) and group (systemGroup) for the daemon to change to (like a separate user owning the sitefusion installation directory, or like the nobody or apache/www-data users who should have at least reading permissions in the sitefusion installation directory). Then start as root. The daemon will then change to the safe user and automatically make sure it can use the log and runtime locations as that user. Start as unpriviledged user: Create new runtime and log directories in the sitefusion installation directory (mkdir run && mkdir log) and change the runtimeDirectory and logfile configuration options to have them point to these locations. Set the changeIdentity option to FALSE. Then start as the unpriviledged user. Note that in neither scenario the daemon will be running as root. In the first it will only start as root and then change to the safe user as soon as runtime and log locations are setup correctly. Make sure the logfile and runtimeDirectory configuration settings contain a path to a logfile (doesn't have to exist yet) and a path to a directory respectively. When you're done editing save and close the file. The second file you have to edit is webfrontend.conf. This one concerns the communication between the webserver and the daemon. Note: From SiteFusion Server 6.0 onward, the default setup is to use sqlite3 instead of mysql for the database used by the daemon to store process and service information. Use the field databaseDSN to set the database protocol, host and credentials instead of using the deprecated fields databaseHost, databaseUsername and databasePassword. The default databaseDSN will use the pre-packaged sqlite3 database in the 'db' directory. The rest of the installation directory needs to have the same permissions if you plan to run the daemon as root and have it change to a safe user. At least it needs to be readable by the user running the daemon. The last thing you have to to is add an alias or vhost to the webserver configuration and point it to the SiteFusion www directory. In the case of apache, either add the following configuration to an existing vhost or create a new one. Notice that you have to point to the www directory in the location you extracted the SiteFusion files to earlier. After this, reload or restart the webserver to activate your new alias. You can test if things are working by opening a browser and navigating to http://yourip/sitefusion/login.php. If you don't get a 404 or 403 error, you will be fine. Depending on your browser you should see a piece of JSON text indicating an input error, or a download dialog for login.php resulting in a textfile with the same contents. If no errors occur, you can shut down the daemon by pressing Ctrl+C and restart without the -d and -f options for production environments. If you are planning to debug instead of running production applications, you can choose to run with the option -d. Debug information is then made available through the log, and the debugger in SiteFusion Admin will be enabled to connect to running processes. The server setup is now completed. Assuming you've set up the client (if not, read here), it will prompt you for a number of options. Server URL is the URL of the server we just set up. So http://yourip/sitefusion. The example application is the administration application so in the application field fill in 'sitefusion/admin'. You can leave arguments empty. Finally, the default username is 'admin' and the password is 'secret'. This password can be changed by editing the file sfadminPasswd.php.inc in the app/sitefusion/ directory. Most error messages will be reasonably clear as to what's causing the problem. If you get errors concerning undefined functions, you're probably missing one of the required PHP modules as listed in the Requirements section above. If the error refers to the logfile path or the runtime directory path, make sure that these paths are correct and writable to the user running the daemon. update 32-9-09: I've added runtimeDirectory as a necessary change since it needs to be changed according to the distribution your server is running. Currently the SiteFusion daemon doesn't work on non-POSIX systems, however you could simply run a virtual machine with Linux to use SiteFusion. what are you recommended linux dist. ? Debian, Ubuntu, etc. ? And ... has vmware appliance for sitefusion download link. And ... If you not recommend linux dist. I'm TURNKEY linux to counsel. We recommend both Debian and Ubuntu, but any distribution should be fine. We have no ready-made vmware appliance but following this tutorial you should be able to create one without much trouble. The 'sfdatabase'-script requires the readline-extension. If you don't have it, the readline() manual page has a substitute function, place it at the top of the script. Can't find daemon/start.php. Please check your 'sitefusionPath' configuration option in conf/daemon.conf, the start.php file it's on sitefusion/daemon/ but i don't know why don't work!